Thank you for reading The Blood-Hungry Spleen. 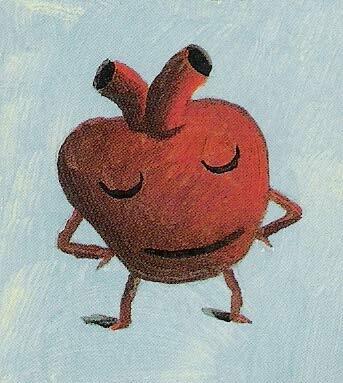 The Spleen has a special place in my heart (lubdubb) because it was my first book published at a major house, Candlewick Press. I’ve been writing poems pretty much since I could write. I studied writing in college and then graduate school. In 1989 I took a job with Poetry Alive!, a traveling company that presents theatrical poetry shows in schools all over the country. It was a pretty natural progression for me to start writing poems for kids. I like to write poems about everyday things, and because of this, I had already written a few body part poems—eyes, ears, fingers, etc. But it was on a trip to Seoul, Korea where the idea really took hold of me. I was conducting a residency at Seoul Foreign School when I met a Life Science teacher named Stacie Nakai whose students had created a life-size anatomy chart complete with bones, blood vessels, organs, skin, and muscles. Ms. Nakai had required her students to color in a picture of the various parts and place them in the proper location. But what made this anatomy chart really special were the poems that each student had written. 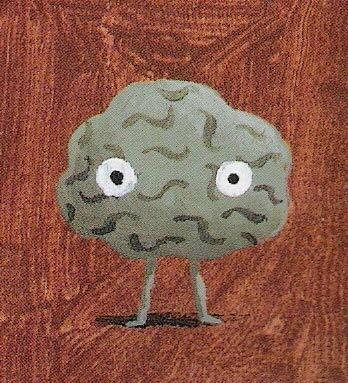 There was a poem about the brain attached to the brain. There was a poem about the eyes written on an eye. A poem about the intestines snaked around the coils of the intestine. I was in heaven. Not only did I have a great interest in anatomy, but here, also, was that little push I needed to get me writing that book of anatomy poems! It’s a long flight from South Korea to Asheville, North Carolina. I spent the whole flight writing poems. When I got home I arranged with Poetry Alive! to take off one day a week. Every Friday, I got up early and spent the day writing anatomy poems at Pack Memorial Library in downtown Asheville. All the research materials I needed were right there. One Friday would be devoted to the heart. Another Friday would be the toes. On a good day I might visit two or three different organs at once. After a year of Fridays, I had a collection of 99 anatomy poems. My publisher of choice was Candlewick Press because of their well-designed books and their reputation. Their books by Robie Harris showed that they could tastefully and respectfully tackle issues of sexuality and reproduction. As a first-time author, I hoped at the most for a handwritten rejection. Luckily for me, the manuscript ended up in the hands of Candlewick editor, Elizabeth Bicknell, who loved it and believed in it. • “Open Eyes” is written from the first person point of view of the eyes themselves. “Kidney Trouble” is written the same way. These poems are called persona poems, poems written in the voice of a particular character. How does the effect of a persona poem differ from that of “Lip Service” (p. 16) or “The Tongue” (p. 17), two poems that are NOT from the point of view of their subject? Try rewriting “Lip Service,” “The Tongue,” or “You Can’t Beat Your Heart” (p. 30) as a persona poem in the first person. • Read “Ode to My Fingers” and “Ode to My Toes” (pp. 20-21). Whereas most poems address the reader, an ode is a poem of praise that directly addresses its subject. Can you think of some common object that is very important in your life, something worthy of praise that you just couldn’t bear to live without? Try writing an ode to it. • Which of the book’s poems is your favorite? Why? • Look at the illustration for “The Blood-Hungry Spleen” (p. 34). A lot of the details that Greg Clarke included in this illustration are NOT anatomically correct. Can you name them all? Now here’s a bonus question: One of the five red blood cells looks more like a real red blood cell than the other four. Can you tell which one? You may have to do a little research to find out what a red blood cell looks like. • “You Can’t Beat Your Heart” (p. 30) claims that your heart beats 100,000 times a day. That is a rough approximation based on an average number of heart beats (about 70 per minute). Now try figuring out precisely how many times your own heart beats each day. You’ll have to check your pulse in your wrist or your neck first. Count the number of beats while you or a helper keep time for 15 seconds. Next multiply that number by four to figure out how many times your own heart beats in a minute (60 seconds). Now you’re on your own. Can you figure out how many “lub-dubbs” your heart makes in a day? • Read “Thirteen Ways of Looking at Your Knees and Elbows.” Notice how the first way and second way are very matter of fact, even scientific? But the other eleven “ways” are very imaginative. Now it’s your turn. 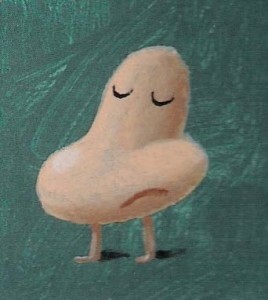 Choose a body part of your own (or else a common everyday object around the room). Now using “Thirteen Ways” as a model, write your own “Thirteen Ways of Looking at a Shoe Lace.” “Thirteen Ways of Looking at Your Belly-Button.” “Thirteen Ways of Looking at Your Fingernails.” You may run out of ideas by “way” number nine but stay at it. It may even take a couple days of thinking. Eventually you’ll come up with all thirteen. • Classroom Idea for Teachers Why not make your own classroom anatomy poem chart? Here’s how. Start with a very large piece of butcher or chart paper. Have a student (wearing pants) lay down on the paper facing upward, with arms held outward. Trace the outline of the student’s body with a thick marker. Be sure to get the details of the students clothing—hat, shirt collar, tennis shoes, etc. Assign each student (or small collaborative team) a particular organ/body part. Provide them with pre-drawn examples to color and cut out, or allow them to create their own. Then ask them to write a short poem about their organ/part using facts from their research. The finished poem can be written directly onto the body part or pasted nearby. Teachers need not grade these poems on literary merit, but they CAN check that students have included a certain number of researched facts. It’s my little urine bank. Although it is not rich or famous. Storing urine to the end. Things would end up for the worse. To help me up the stairs. To kick at little stones. And in tag to run away. With which I cannot part. And have lots of fun. • This book was originally titled Our Amazing Body Language. 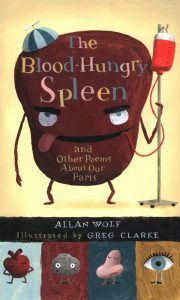 It was renamed The Blood-Hungry Spleen and Other Poems About Our Parts at the last minute when a few people at Candlewick Press raised concerns that the title was too similar to another Candlewick title, It’s So Amazing by Robie Harris. • It took three years from the time the manuscript was accepted to the time the finished book appeared on the shelves . This is typical in the picture book business. • The Blood-Hungry Spleen is mentioned in Sarah Vowell’s book, Assassination Vacation (Simon & Schuster). 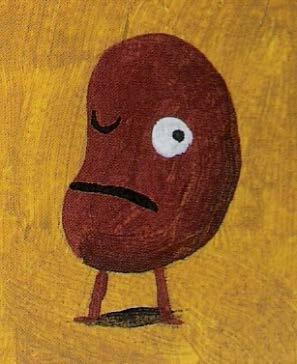 In it Vowell mentions buying The Spleen for her nephew. Sarah Vowell plays “Violet Parr” in the movie The Incredibles. I think Sarah Vowell has the perfect voice to recite “A Sad Tale or Hey, Who Stole My Seat?” (p. 29). 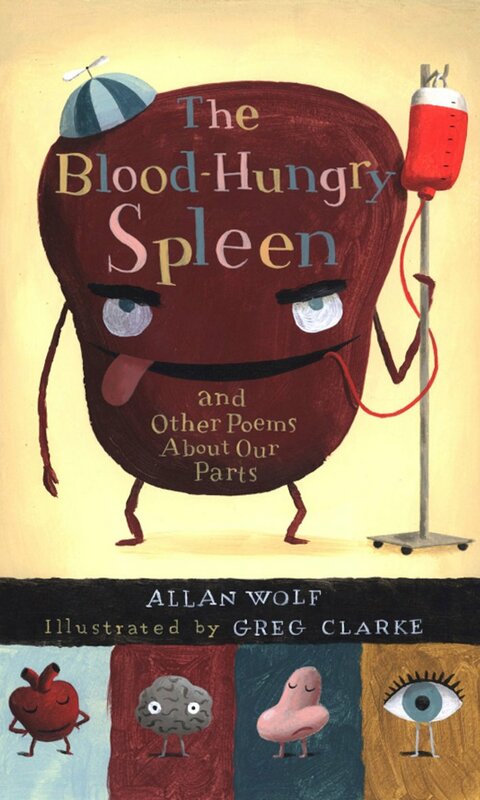 • The original Spleen manuscript included a poem called “The Appendix.” But the editor had it removed. A poem titled “Tonsils Are For Taking Out” was . . . well . . . taken out. • “Kidney Trouble” (pp. 42-43) is written in the style of Paul Fleischman’s collections of poems for two voices, Joyful Noise (all about bugs) and I Am Phoenix (all about birds). In public I perform the part of Kendra with my nine-year-old son who plays the part of Kenneth. • The title “Thirteen Ways of Looking at Your Knees and Elbows” (p. 22) is a not-so-subtle reference to the poem “Thirteen Ways of Looking at a Black Bird” by Wallace Stevens. The thirteen poetic snippets, however, are written more in the style of Carl Sandburg who had a farm near where I now live. I like to think that Sandburg would have gotten a real kick out of this poem. • The poem, “Open Eyes” (p. 14) is one of three different eye poems that I had to write before coming up with one that worked. 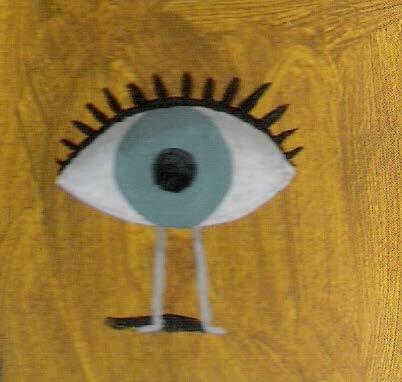 • Look closely at the illustration of “Open Eyes” (p. 14). Look at the second pair of eyes from the top. In an early version of this illustration Greg Clarke drew the winking eye closing upward instead of downward. It didn’t look right to me. To fix it Clarke painted over the upward lash and brushed in the downward lash you now see. Look closely and you’ll make out where Greg did the patch job. • “A Sad Tale or Hey, Who Stole My Seat?” (p. 29) was originally one of a pair of derriere poems. The other was titled “The Sit-Upon-It Sonnet” and it was actually in the form of a Shakespearean sonnet. “A Sad Tale,” although written in fourteen lines, is not a true sonnet. It is written in rhyming couplets and is not in strict iambic pentameter. • I’ve tried to use a variety of rhyme-schemes in this collection. “A Sad Tale” (p. 29) is in couplets, AA,BB,CC,DD,EE, etc. “Lungs” (p. 35) is in the common ABCB, EFGF, etc pattern. “The Tongue” is in the more difficult ABAB, CDCD pattern. “You Cannot Rankle the Sturdy Ankle” is in an unusual AAAB, CCCB, DDDB. I was most proud, however, of the rhyme scheme of “Your Brain’s the Boss.” Originally, the poem was in four-line stanzas where the first three lines rhymed with each other and the fourth line rhymed with the first three lines of the next stanza. On paper it looks like this: AAAB, BBBC, CCCD, etc. I called this “synaptic rhyme” because the rhyme of the last line of each stanza had to jump across the line break to the next stanza, just as a brain impulse must jump from one cell across a synapse to the next cell. Later during the editing process, the poem’s entire second stanza was removed. Sort of a lyrical lobotomy. The original rhyme scheme was much pacified.